First Class on All Nippon Airways – Cheaper than you might think! 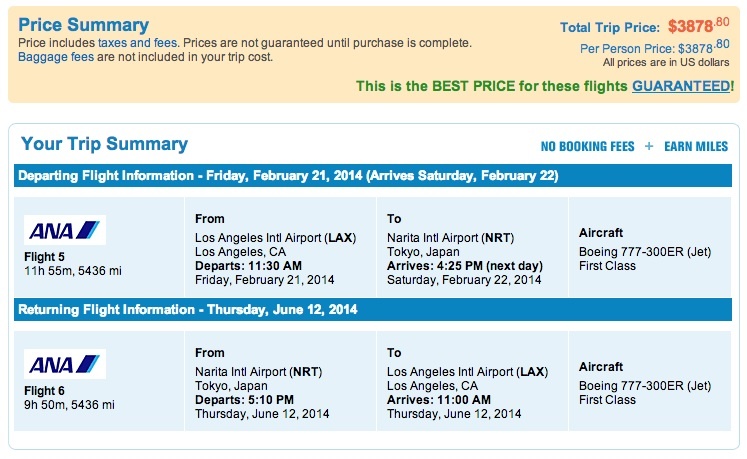 How much do you think first class might cost for a round trip flight between Los Angeles and Tokyo? Some people might not value the benefit of flying first class, but the additional mileage earned on such tickets along with the experience, I think they are worth something. Definitely I would pay more than Economy Class for it. As I was able to experience ANA’s first class before using miles, I realize that a round-trip ticket on ANA between Tokyo and Los Angeles is not really as expensive as one thinks since there are some deals to be had. Due to United Airlines and All Nippon Airways having a codeshare for flights between Japan and North America, flights on ANA First Square can be had for less than $4,000. While for many passengers this is a hefty figure, Cathay Pacific routinely charges around $2,200-$2,800 for their Premium Economy to Asia out of Vancouver and Los Angeles. Through Priceline, I was able to price a return flight on ANA in First Class between Narita and Los Angeles for $3,900 inclusive of taxes. This is definitely a good deal when you factor in Rimowa kits on the flights to Japan, kaiseki course meals that rivals many Japanese restaurants and the comfortable experience of flying across the Pacific. The only catch is that the route seems to work only from the United States. Which means that passengers based in Asia need to buy or redeem a round trip ticket themselves to enable them to have 2 trips to the US. I do not know if these tickets work on one-way routings, though do note when booking that the flight is operated by All Nippon Airways on flights NH 5 out of Los Angeles and NH 6 into Los Angeles. Some flights issued by All Nippon Airways are actually flown on United Airlines and I wouldn’t even pay $3,000 for a flight on United Airlines, even if it is on first class. This is a good deal, though there are some accounts of first class fares being as low as $3,600 last year.